It was a beautiful day, on a beautiful mountain, near a beautiful medieval monastery, as Artec employees continued their work on a pilot project that began earlier that year at the Erevan city history museum a few months earlier. 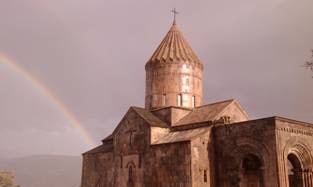 Artec was asked to take part in a heritage preservation project that would digitize local hachkars (unique hand-carved gravestones only found in Armenia). During the opening ceremony of the much-awaited aerial tramway to Tatevskiy monastery, Artec showed visitors a 3D image of a hachkar carved by a famous 13th century artist named Momika. The guest wore 3D goggles, which allowed them to see the smallest details of the great work of art. One of the finished 3D models was milled out of wood using a standard CNC machine. This souvenir was reproduced and given as gifts to the Armenian Prime Minister Tigran Sargsyan, high level clergy and other honored guests attending the ceremony.